Course work includes child growth and development, physical/nutritional needs of children, care and guidance of children, and communication skills with parents and children. Students will foster the cognitive/language, physical/motor, social/emotional, and creative development of young children. The School-Age Development curriculum prepares individuals to work with children from kindergarten through middle childhood in diverse learning environments. Students will combine learned theories with practice in actual settings with young children under the supervision of qualified teachers. Early Childhood students will demonstrate their understanding of child development and environmental influences on development and learning, and will be able to create environments that are healthy, respectful, supportive, and challenging for all children. Early Childhood students will be able to support and empower children and families by building trusting and respectful relationships and involving families and communities in their children’s development and learning. Early Childhood students will be able to use authentic assessment responsibly to make informed decisions to guide all children’s learning. Early Childhood students will be able to use developmentally effective approaches and teaching strategies. Early Childhood students will be able to use content knowledge effectively to build meaningful curricula. 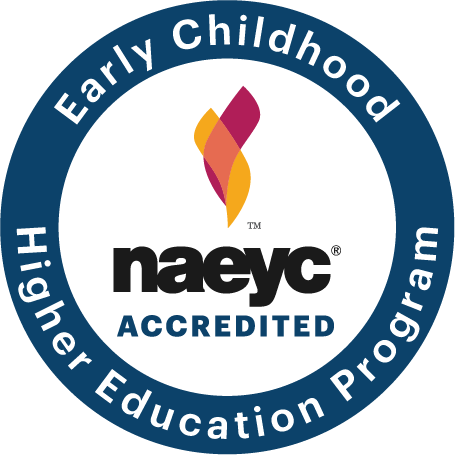 Early Childhood students will know and understand the value of professionalism, ethical conduct, and advocacy in the early childhood profession. Academic year in which a Fall cohort of full-time students enrolled at the institution Percentage of those students who completed the program within 150% of the published timeframe Percentage of those students who completed the program within 200% of the published time frame.